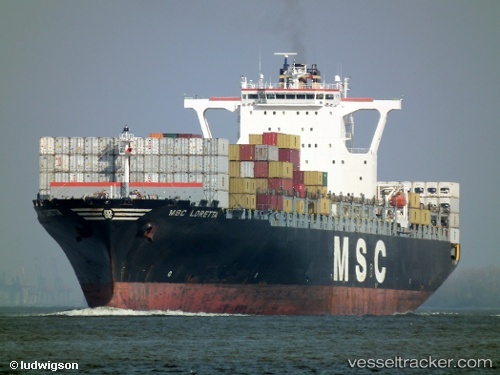 On Apr 15 police found several bags with drugs in containers offloaded from MSC Loretta, which is docked in Santos, Brazil. It is understood, that the police was tipped off. Police didn’t reveal quantity, character and the cost of the drugs. Vessel was boarded by police before berthing. In the night of May 7, 2011, the "MSC Loretta" ran aground 5 NM north of Wangerooge. The customs boat "Bad Bramstedt" reached the casualty at 11 p.m. At that time the vessel had refloated without assistance. A boarding team was sent for investigations. Drug tests were without results. The vessel was escorted to Bremerhaven by the "Bad Bramstedt" and berthed at Container Terminal 1 on May 7 at 1.40 a.m. After the investigations were completed, the ship was allowed to resume its voyage to Felixstowe and departed from the Strom Quay on May 8 at 00.30 a.m. It finally reached the Trinity Terminal at Felixstowe at 9.20 p.m.